Can I get Superfast broadband in the Scottish Highlands? Yes, you can! Highland Wireless is a fixed wireless internet service provider that delivers superfast wireless broadband in the Scottish Highlands. Highland Wireless is a wireless internet service provider that delivers superfast broadband to the Scottish Highlands. Our aim is to deliver fixed wireless systems across some of Scotland’s remotest areas, such as the Highlands. Our wireless technology means we can deliver superfast broadband to homes and businesses throughout the Scottish Highlands that have currently do not have access to superfast broadband. With the Internet becoming more and more part of our daily lives, it is important that we all have equal access to a stable, high quality and fast broadband connection. If you live in the Scottish Highlands and are struggling with slow speeds and an unreliable connection, then we can help. Unlike satellite broadband, our wireless system will deliver a reliable connection. Our network is designed to have low latency and high speeds, resulting in a high-quality internet service. There is no cap on data usage — all we ask is that you adhere to our unlimited data fair usage policy. There are no phone lines required and an engineer will visit your home to install the equipment and show you how to connect your devices to your new superfast broadband. Simply contact us today on 01862 808077 or use the form and we’ll get straight back to you. We will find the best superfast broadband solution for you. Call us on 01862 808077 and one of our team will be happy to assist you. We use fixed wireless point to point technology to create a series of transmission stations, which are connected to our fibre optic backhaul. A small antenna is fixed to the exterior of your property, pointing to the nearest transmission station and will receive the superfast broadband signal, eliminating problems associated with copper cables and distances from exchanges and cabinets. A small router is located within your property which provides wired and wireless access to the internet. 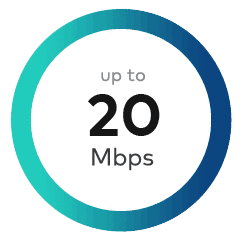 Once you’re connected to our network, you’ll have access to superfast broadband. At our main data centre, we have an ultrafast internet connection to the wider internet, where all internet traffic is sent and received. By using wireless technology we eliminate the problems associated with copper cables and distances from exchanges and cabinets. Our network is designed to have low latency and high speeds, resulting in a high quality internet service for our customers. Our network provides faster speeds and a more reliable connection than satellite broadband. We do not cap our customers data usage, all we ask is that you adhere to our unlimited data fair usage policy. Residential users will receive up to 50Mbps download and 20Mbps upload. Stream on multiple devices, watch your favorite TV shows and movies. Great for productivity, social media and online gaming. Fair use: We do not cap our customers data usage, all we ask is that you adhere to our unlimited data fair usage policy. Our superfast broadband is perfect for gaming! If you’re downloading large game files for your Xbox / PS4 or playing the latest online games, our service will work for you. Voice over Internet Protocol allows you to make landline telephone calls over the internet. VoIP is cheaper and is better quality. You don’t need to pay line rental either. No more taking turns using the internet! With our superfast broadband speeds, the whole family will be able to use the internet at the same time. Sign up to one of our plans below. Perfect for downloading, streaming movies and TV shows in HD, and online gaming. Spread the cost of your installation over 12 months. 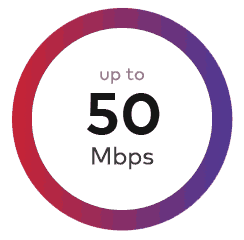 † Up to 50Mbps download speeds and up to 20Mbps upload speeds. Need to change your installtion date? A few common questions. For a full list, head over to our knowledgebase. Fixed wireless is when devices are located in fixed locations, like a house or commercial property, as opposed to mobile phones and tablets that move around. Generally, a small CPE (Customer Premises Equipment) unit is placed on the exterior of your property and will receive a signal from the nearest transmission station. Unlike some old copper cables and cellular signal, fixed wireless provides a very reliable and superfast service. Do I need line of sight? Yes, you will generally need line of sight to the nearest transmission station to receive the signal. Don’t worry if you live within trees or do not think you can get line of sight – when we come to carry out our survey we will discuss the different options with you. We have a few different ways up our sleeve to get our signal to you! No, you do not need a phone line to receive our service. If you would like to keep your current landline telephone number you can either continue with your current phone line provider or move over to VoIP. VoIP stands for Voice over Internet Protocol. It allows you to make and receive landline telephone calls using your new internet connection, resulting in no line rental costs! Please check our coverage map to see when we will be in your area. If there is no information about your area on the coverage map, please contact us and we can advise you on our plans. What is a Fair Use Policy (FUP)? There is no limit to your data usage but we do request that you adhere to the Fair Usage Policy. The Fair Usage Policy, details that users use their connection in moderation – so basically do not download the whole internet in one night! The FUP is in place to ensure the network is performing well for everybody at peak times. If our monitoring system notices that a user is using large amounts of data and not following the FUP, we will throttle their connection at peak times. We don’t do this to be difficult, but we want to keep the network fast for everybody. I have a small home business, am I classed as a business customer? No, if you are a small home business user, you will be classed as a residential customer. We recommended all businesses to get in contact with us to find the best package for their needs.